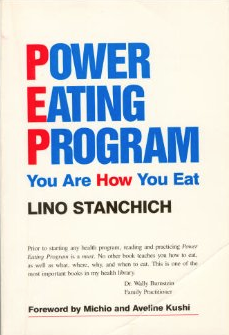 Lino Stanchich in his book POWER EATING PROGRAM You Are How You Eat (available on Kindle as Conscious Eating) suggests that chewing food not only can improve your life and also save your life. Your grandmother might have told you to chew every mouthful of food at least 100 times to stay healthy. The father of Lino, Antoni Stanchich was in a concentration camp in Germany during the second world war and there wasn’t much food to eat and he intuitively discovered that chewing water (because it was so cold) would give him energy. Initially, he would chew each mouth of water 50 times and notice that the more he chew it the more energy he would get. Then he started to chew all his food, 150 times, sometimes 300 times each mouthful. He believed that the magic number for chewing was 150 times. To cut a long story short, people were dying of starvation daily in that camp and Antonio believes that this simple act of chewing helped him to survive. In fact, he and his two friends who were also practising chewing were the only people to survive from his original crew. The function of feng shui is to change and improve your external circumstances but there are more powerful influences that can impact your life i.e. you and people around you. Samantha Cameron seems to be a fan of chewing too, ‘subscribing to Dr Franz Mayr’ clinic’s principles: chew half an avocado for a meal – each bite at least 30 times. Posted in Chi, Feng shui for kitchens, Health and tagged Chewing, Dr Franz Mayr clinic, Samantha Cameron.